ur 1960 Alco diesel powers the North Pole Flyer, our railroad's own Christmas ride! 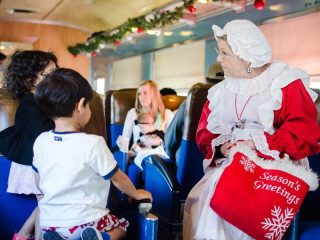 Each car is decorated for the season, and Santa and Mrs. Claus will be on board the train. Santa has a gift for each child, while Mrs. Claus and her helper serve delicious Christmas cookies, and all passengers enjoy complimentary hot chocolate! Read long with our Christmas story, The North Pole Flyer, as you spend time with family and friends riding in our vintage train cars. This approximately 2 hour round trip to Bertram does not stop and deboard as all events take place on board the train. As of November 20, all dates for the North Pole Flyer have been sold out except for two runs on Sunday, December 14. Check in to make sure that tickets are still available.